Colton's New York and Adjacent Cities. 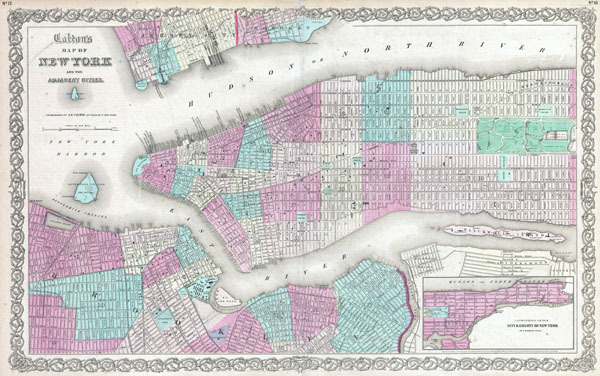 This is a beautiful J. H. Colton map of New York City and vicinity, including Manhattan as well as parts of Brooklyn, Jersey City, Hoboken, and Queens. This is the third state of the Colton New York City map in which Central Park is depicted according to an early version of the Olmstead plan. This important map would become the template from which Johnson and late later S. A. Mitchell Jr. would build their own New York City maps. Map is a lithograph from a steel plate engraving. Beautiful hand color. Wonderful attention to detail includes individual streets and even important buildings and parks. Originally prepared as plates no 17 and 18 in J. H. Colton's 1861 issue Atlas of the World…. Dated and copyrighted: 'Entered according to the Act of Congress in the Year of 1855 by J. H. Colton & Co. in the Clerk's Office of the District Court of the United States for the Southern District of New York.' Published from Colton's 172 William Str. Office in New York. Colton's Atlas Of The World, Illustrating Physical And Political Geography. By George W. Colton., (1861 issue). Very good condition. Original centerfold. Light centerfold discoloration. Text on verso. Rumsey 0149.024 (1856 edition). Phillips 816.